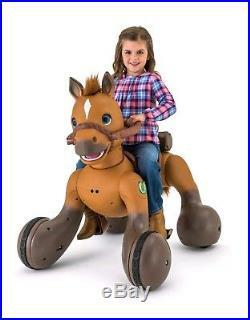 12-Volt Rideamals Scout Pony Interactive Ride-On Toy. 100 unique sounds and movements. Ensure that every playtime is different from the last. Fully motorized eyes, ears, head and wheels. Make Scout come to life! 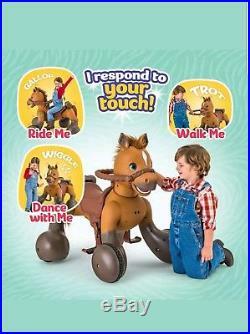 Interactive fun for boys and girls: Feed it, brush it, pet it, walk it, ride it or dance with Scout. Over 100 unique sounds and movements. Brush, apple, carrot, saddlebag, 12-volt rechargeable battery and wall charger. Power Trax Rubber Traction Strip Tires keep the ride smooth and steady. One Step Direct Connect Charging System makes it easy to keep the fun going. Scout can trot (3.5 MPH), gallop (4 MPH) or go backward (3.5 MPH). Sit in the saddle, hold the reins, pick your speed and you’re on your way! Kids can hear munching noises as they feed Scout a tasty treat. Scout’s ears move when its mane is brushed. Scout will respond with different movements and sounds when you pet its nose and cheeks. Pull the reins in front of the head and press the button to get Scout to trot along behind you. Press the horseshoe button and Scout will prance with you! Just make sure you’re standing in front of Scout to see the awesome moves. 3 to 7 years. Assembled Product Dimensions (L x W x H). 35.50 x 34.25 x 27.00 Inches. Scout can trot, gallop, or go backward. You can hear munching noises as Scout eats a tasty treat. Apple and carrot included. Pull the reins in front of the head and press the button to get Scout to trot along. 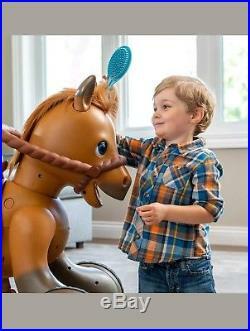 Includes one ride-on toy with 12V battery and charger, saddle bag, grooming brush, and apple. See instructions for details. One-step Direct Connect charging system makes it easy to keep the fun going. 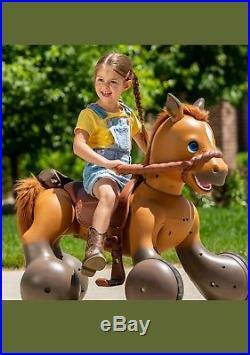 The item “12-Volt Rideamals Scout Pony Interactive Ride-On Toy 2 days 50% OFF” is in sale since Sunday, December 30, 2018. This item is in the category “Music\Records”. The seller is “smart_buy87″ and is located in shanghai. This item can be shipped worldwide.